Most of us have plants in our gardens that we grow as ornamentals but that have their uses as medicinal plants. The best known is foxglove (digitalis) and there are many herbs that contain useful drugs or remedies, the commonest being sage (Salvia officinalis – from salve = to heal). 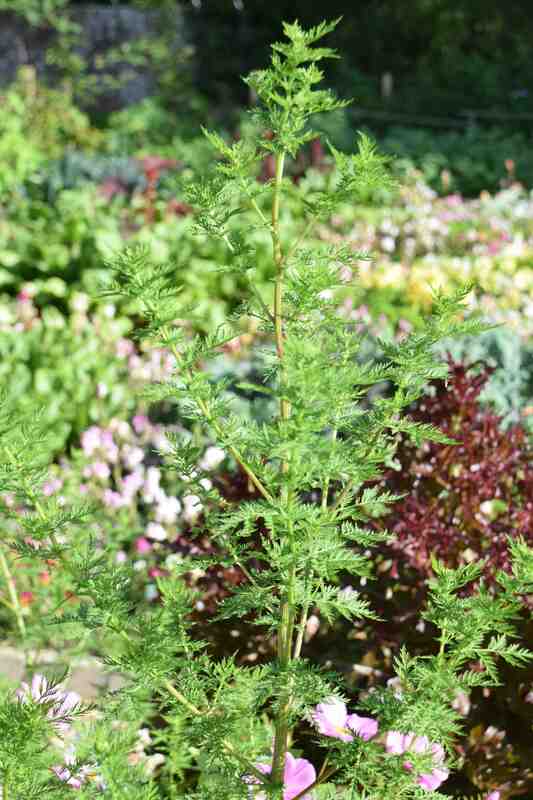 I have grown sweet Annie (Artemisia annua) every now and then for many years, ever since I bought a packet of seeds in the USA twenty or so years ago. I usually find that it selfseeds lightly if I leave plants to die in the garden, but never quite enough. In the top photo (also posted yesterday) you can see the feathery foliage that makes the ferny leaves of cosmos look almost coarse by comparison. But a lot of feathery leaves is not quite a good enough reason to go to the effort of raising a plant from seed, in gentle heat in spring, and then accommodate the plant that can, if well grown, reach 2m high by autumn (mine are 1m at the moment – see below) and has masses of grey/green, minute flowers that add very little to the overall look of the plant. I am sure I haven’t convinced you yet. What the photos can’t show you is that the whole plant is covered in a gummy resin that smells wonderful. Most artemisias are aromatic but this one is sweet and resinous, not that different from the balsam poplar I mentioned the other day. What convinced me to grow it in the first place is that it is useful for autumn and winter decoration. You can just hang up a plant and dry it and then wrap it in a ring to make an aromatic wreath a la Martha Stewart. It’s a great little plant. The resins are widely used in perfumes. The flowers, though small, are good for pollinators and there are so many reasons to grow this lovely plant. Remember that it is quite tall and bushy and needs space but the light foliage is a lovely apple green. As for companions, my immediate thought is Verbena bonariensis because of the similar, airy structure but I feel that two wispy plants might not have much impact. So I think it would be better with something more solid and bold. 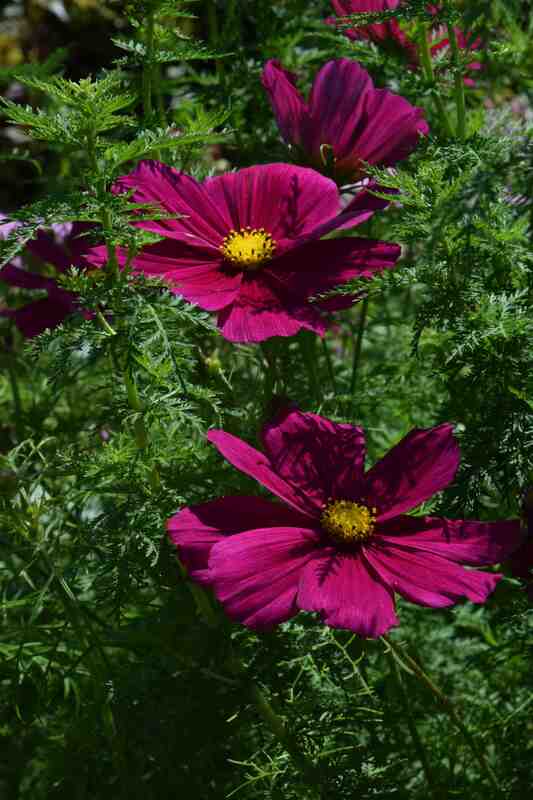 Tall, perennial helianthus and rudbeckias, eupatorium, canna, big dahlias and, of course, cosmos might work. But this delicate little plant has a poorly kept secret and is at the centre of a humanitarian controversy. It is widely cultivated around the world but has been used against fevers in China for 2000 years. 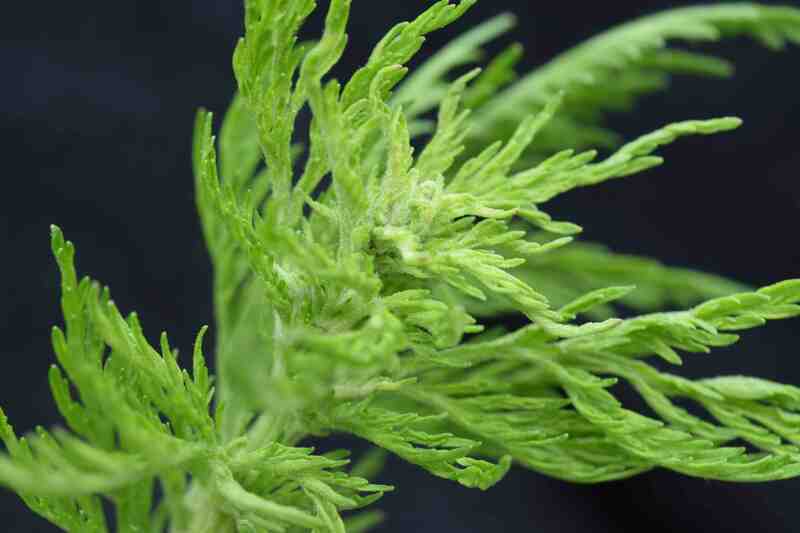 Of course lots of artemisias have interesting chemicals – after all it is Armetimisia absinthium that gives Absinthe it’s brain-rotting effects. In the 1970s it was discovered that artemisinin, a chemical found naturally in sweet Annie, is a powerful weapon in the fight against malaria. Just as the protozoan parasite (plasmodium) was found to be becoming resistant to existing antimalarial drugs artemisinin was discovered to be very toxic to one stage of the parasite’s life cycle. Almost by the way it has other anti-microbial activities too. It is possible that the plant can be used dry and made into a tea but I read that to be effective you would have to drink 5 litres a day so this is not very practical. Instead it is now grown commercially as a crop so that the artemisinin can be extracted. This is great news. The drug saves lives and, just as importantly perhaps, it provides employment for farmers in Africa and Asia for whom this is a valuable crop and a living. But like all good things – this is coming to an end. A bio-engineered yeast has now been developed that can produce artemisinin in vats, more cheaply, putting thousands of livelihoods in jeopardy. So my simple little foliage plant that I loved for its fragrance is actually a plant at the centre of the cure of humankind’s biggest killer and an ethical controversy. Surely that is a reason to grow it, at least once. You’ve convinced me to give it a try, if nothing else, for its perfume and it’s beautiful name!